Um taking advantage of something to the extent of what some were doing with the rock would be the standard definition of exploit. But we really don’t need to go into that again since the devs already said they see it that way. And sub value coin will be able to be done on shop stands too when that coin machine comes out. I personally am looking to using the coin machine for all the rock I get from mining. For that way of using they have become worth way less. They also can’t really go down too much due to the ingredients. I think prices and demand might stay about the same tho I, as a pie seller, would love it if they would sell more for same or higher price! So everyone, prove me wrong please! I think widely and the way you interpret it is different from the way I do. When I say widely, I just mean a lot of people use it primarily that way. Not that no one else used it in other manners. I know not everyone has that min/max mentality but it’s my experience that more folks, than not, in online games lean towards that min/max lifestyle of gaming. I could be way off but I’d wager a large majority play that way, else this whole reason for this exp food change wouldn’t have ever come up. People need to stop claiming things are some way without actual evidence to support these claims. Yeah a bit concerned about the coin machine too. Don’t you think if we had a scrapping machine that turns refined/advanced blocks to their basic components (minus some blocks as a penalty) and then we have a coin machine that only accepts those basic blocks - don’t you think that’d be better? Because anyway those basic ingredients are so common turning them in to the machine would only help people save storage space and get rid of them quickly instead of waiting to sell them to someone. Plus, the machine can always undervalue things as to ensure whoever sells to it just wants to get rid of things and get some coin instead of just despawning them - might not affect the economy this way? I think the advantage to the coin machine is it offers players a way to dump items they will not be using without spending a lot of time scouring the universe looking for someone with request baskets and coin in those request baskets. I think the developers will not be pricing according to market as they are not going to want to have to change the pricing everyday. They will end up setting a base value. I think players might not like the base value (might think it is too low) but if they want more they can spend the time trying to find it. I do think if the store owners try to match the prices of the machine for buying, they are not going to get any customers. Why should I give you footfall and make the effort if I can get the same prince using a machine at my workshop? Yep, agreed with all this. I think it will stimulate the economy bigtime actually, since it will take a glut of surplus stuff off the market and put coin in the hands of people who will spend it. Also, by setting a base price, it will keep prices from ever falling below that, and they’ll probably remain at least a bit above since people will need to give incentive to sell to them rather than the machine. The machine prices will be low compared to current market rate I’m sure, but request basket prices are falling bigtime for so much anyways, so that will at least set a bottom. I’m extremely happy about this, as I’ll always have a way to get more coin with a bit of work - this is even more important for newcomers, too. The newcomers will also be tending to buy more with the coin they get, I think. And there is stuff like rock salt and ice that I literally can’t even give away sometimes, so it gives you SOMETHING to do rather than discarding it. Thanks for making it 5 skill pages now @james. Tho I’m a little sad that stone won’t be instant craft. Went onto the test server again and was curious if a new batch of exoplanets had spawned… sadly the same names appeared as before. Would really like to see what the next exos were liked compared to the first ones. @james great to see you guys are still listening to the community, there are some good changes in there now, the extra xp for unlocking regions particularly. The extra skill pages are another although I still don’t see them being as viable as alts. Would you consider offering a percentage of your total skill points on any skill page on purchase, say 20 to 30%, so a level 50 character buying a skill page would have something usable for their money but by no means a maxed out character. The extra skill pages are great for people that have a similar play style to mine. I’ll have the 2 more skill pages filled as soon as it hits live. I know quite a few people that far surpass me in level as well. I have 1 alt at lvl 50+ but don’t use him because I don’t like having to switch characters and give perms to him and keep track of his inventory etc. it’s easier to just use my 1 character to do what I need. As for myself I didn’t get to my level by the rock method either. For the people that I know higher than myself I can’t say for sure if they did or not. I really never understood how people have a hard time getting to lvl 50 tho. But I guess that’s because I saw mining was fastest way there so I did that first so I could get my next skill page and focus on the other things I wanted to do. What are the Exo planets like? Are they very similar to normal planets, just with different colours? Any T7s on Test server? How do you warp to them, is it with a warp totem? Yea t7 was there last week and since he said same planets this week I imagine t7 again. And only way to exo is with the warp totem. Also from my understanding the mobs are pretty op. I can’t comment if they are like normal planets since people haven’t talked about that much. So far from what I’ve seen nothing crazy, the one on test looked a bit like Houchus or Alnitans. I much prefer the Teaching Food to not have a time limit, it always felt like I was wasting it if I wasn’t constantly doing something or if I logged on without having stone that had finished crafting - awesome change! Nooooo! 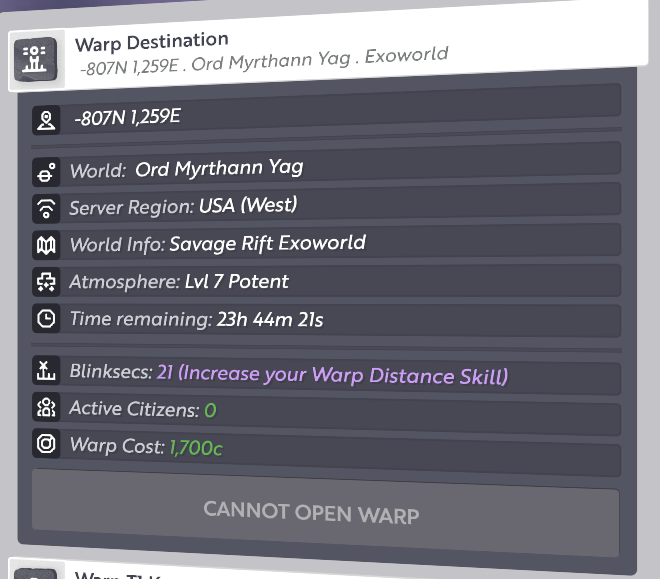 I havn’t increased my Warp Distance Skill on any of my characters! Seems that quite a few are getting into the food industry now lol. But while you are all competing in that, I’ll be in my lair, scheming away and crafting the items that will have increased in value due to their market neglect and inevitable short supply. Muwhahaha! Hmmm, Shame that foods didn’t make your character fat and slow. I could make a killing on diet products.